There’s plenty more wow-factor about the layout of the 665, too. One of three new extra-wide (hence Grande) flagship twin axle caravans from Swift for 2019. 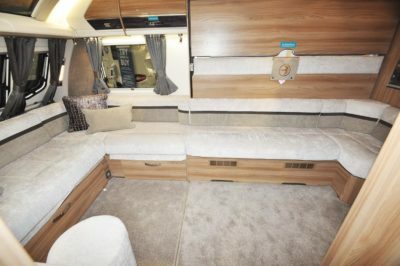 That’s thanks to its L-shaped front lounge, L-shaped kitchen, central wraparound seating section and pull-down double bed, plus fixed longitudinal bunks – a six-berth floorplan that really does offer something different. It effortlessly lives up to its Elegance name, too, with an overly generous specification set in a body using Swift’s latest Smart 3, completely timber-free construction (a first for the maker) – backed by class-leading 10-year bodyshell and lifetime water ingress warranties. 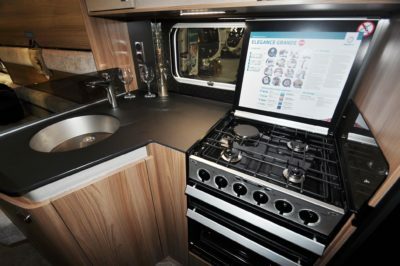 That kit count includes all manner of luxuries – or necessities – from premium jockey wheel to rear-view camera, Alde central heating to the latest Dometic cooker, on-board fresh water tank to illuminated curtain pelmets. Keeping an eye on all this, and more, is the latest incarnation of the ever-evolving Swift Command system, allowing you to operate key facilities via an app as well as a new, larger touchscreen. Part of this is Swift’s Thatcham Cat 6 approved Command Tracker, which will give you a healthy discount on your caravan insurance. 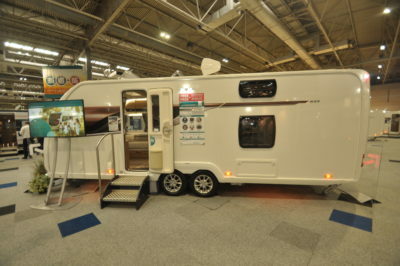 As with any caravan – extra-wide or not – it’s all about interior space and logistics. There’s an open-plan feel to the 655, with its seating extending across the front and along the offside, and a ledge for a flatscreen TV (and a large one, at that) on the nearside. Italian “Tecnoform” furniture throughout, includes a two-tone gloss finish to the overhead locker doors. 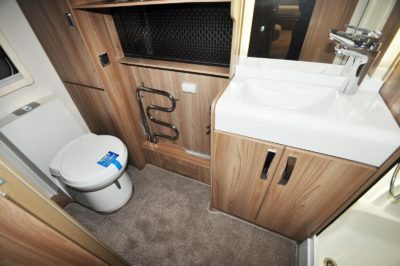 There’s also a double-sliding doored wardrobe of a size befitting its six-berth status. 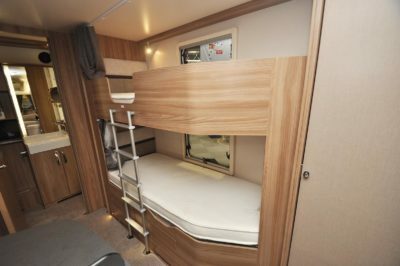 Those rear bunks are the only permanent fixed beds, although the central double bed is easy enough to pull out and drop down into position (as shown in our video). 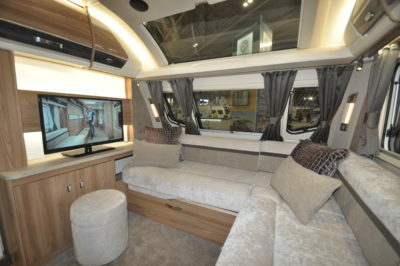 The biggest berth, though, is the 1.94m x 1.37m double made from the front seating. The kitchen is the usual Swift upmarket affair. That’s the latest Dometic cooker, with cut-out safety feature to its glass lid, along with what’s become the Swift-standard Fenix worktop, inset sink with add-on drainer, and a large cupboard under the sink, housing slide-out racking as well as a cutlery drawer that seems rather small in such a context. To the right of the cooker, however, it’s a huge, 190-litre Dometic fridge/freezer. Overhead is an electric vent. 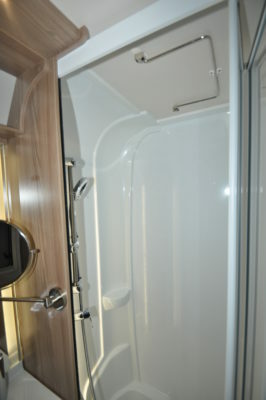 The “big space” theme continues at the back, where the full-width washroom incorporates a plastic-lined shower cubicle with Ecocamel showerhead and two plugholes. The washbasin is set off-centre, leaving plenty of room around the swivel-bowl toilet. Details include a shaving mirror, stereo speakers, window, heated towel rail, open shelving and locker storage. Like it? Not sure? Of course, there’s one way of finding out how successful a new idea like this has been – see who’s copying it next season. Then again, why wait? Safety & security Swift Command, including Thatcham Cat 6 tracker (subscription required), Al-Ko AKS 3004 stabiliser, Al-Ko ATC, Al-Ko Secure wheel locks, infra-red alarm system, rear view camera, smoke alarm, carbon monoxide detector, CRiS, VIN Chip. *Caravan insurance cost based on Swift Elegance Grande 655 caravan retailing at £34,370 fitted with Swift Command Thatcham Cat 6 tracking system, Al-Ko Secure axle wheel locks, hitchlock, infra-red alarm, Al-KO ATC and rear view camera. Kept on drive at HX4 0BE behind locked gate post. Caravanners over 30 years old, claim free for three years and a member of a caravanning club. £100 excess. 180 days European cover and up to £75 per day for up to 15 days emergency accommodation cover included. Legal expenses cover, extended European cover and other emergency accommodation expenses cover options are available at extra cost. Quote includes 12.5% online discount and 12% Insurance Premium Tax and is correct as of 09.11.18.